Dorset Naga® (Capsicum chinense), has a heat level that averages around a million Scoville Heat Units (SHUs), though it has been measured at 1.6 million SHU by BBC Gardeners’ World, making it one of the hottest chillies in the world. 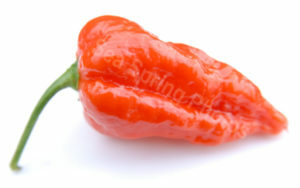 Its scorching heat, combined with a distinctive fruity aroma, ensures that Dorset Naga® it a truly exceptional chilli. 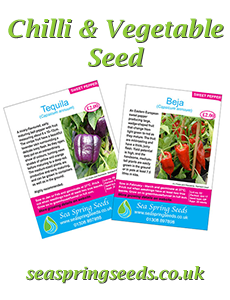 Dorset Naga® was developed at Sea Spring Seeds by us from the Bangladeshi chilli called naga morich. The original stock came from an Asian shop in Bournemouth, and it took us several years to develop the distinctive, uniform and stable population that we named Dorset Naga. We then submitted the variety to the EU Community Plant Variety Office (CVPO) in France. After two years of independent trials the CVPO announced Dorset Naga is a new variety and awarded us Plant Breeders’ Rights. This means that Dorset Naga has variety protection, and Sea Spring Seeds is the only authorised seller of Dorset Naga seeds. CVPO also made it clear that other super hot chillies, such as naga morish and bhut jolokia, though closely related to Dorset Naga, are not the same variety. All superhot chillies are challenging chilies to grow. However, it is our experience that Dorset Naga is easier, and more productive than many of the others. The fruit are very fruity-flavoured and are a superb ingredient for superhot sauces. We also sell Dorset Naga plants and seeds at all the shows we attend (see “events” to see which shows we are attending).